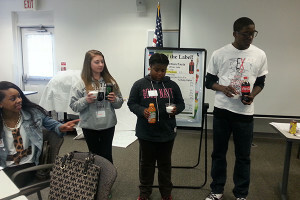 Through the UD Cooperative Extension Food Smart Families program, teenagers discuss the value of nutrition. “Drink Low-Fat Milk and Water Instead of Sweetened Drinks!” This lesson will teach children the importance of drinking healthy beverages, especially milk and water, rather than soda and energy drinks. The children will get to make and try a strawberry smoothie. “Eat a Rainbow: Eat More Vegetables and Fruits!” This lesson will use food models and veggie bingo as a subtle way to encourage children to eat more fruits and vegetables. The children will make and taste calabicitas, a delicious veggie stir-fry that features a rainbow of vegetables. “Make Half Your Grains Whole: Eat More Whole Grains!” More whole grains equals more fiber in the diet. Children will compare various grains and get to try oatmeal pancakes as part of this lesson. Learning to read nutrition facts labels will help children find the whole grain and see how much fiber it contributes to the product. “Healthier Foods Fast: Eat Fewer High-Fat, High-Sugar Foods!” Making “blubber burgers” will help children visualize the amount of fat in many fast food offerings. Comparing menus for healthier options will educate the children about better choices. Broccoli bean quesadillas will be prepared to expose the children to a quick homemade alternative to fast food. “Power Up the Day: Eat Breakfast!” Breakfast parfaits are a quick, easy, on-the-go breakfast that will dispel the “I don’t have time” myth when it comes to breakfast. “Breakfast Olympics” will teach children to compare breakfast options in a fun and interactive way.